Explore impressive St Petersburg and historic Moscow. 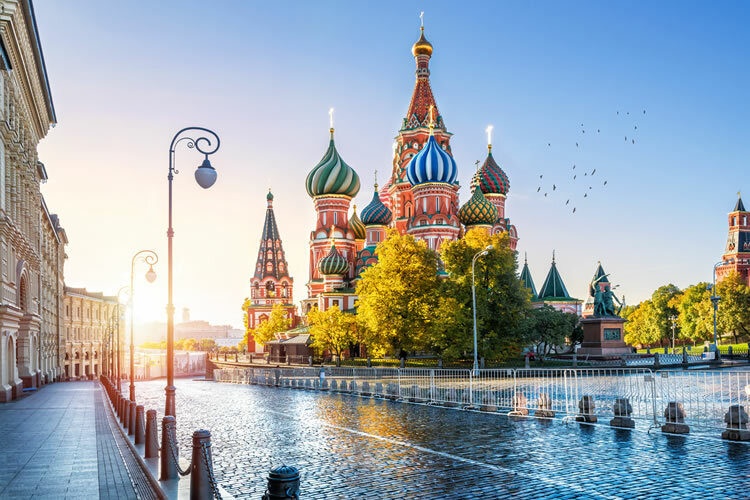 Discover a wealth of historic treasures – from the picturesque wooden buildings of Kizhi Island to the splendours of the Hermitage collections - on this leisurely river cruise. Fly to St Petersburg and embark your ship. Founded by Tsar Peter the Great in 1703 as Russia's ‘Window on the West’, this city was built as a showpiece, with impressive neoclassical buildings and spacious avenues. An included panoramic tour takes in the city’s beautiful monuments and architecture, including Summer and Winter Palaces, the impressive Admiralty Building, the Victory Column and St Isaac’s Cathedral. Today another included tour visits the world-renowned Hermitage Museum. The museum is one of the greatest art galleries in the world and is set in a magnificent palace that contains enough treasures to keep you fascinated for days. Set sail this evening and enjoy a welcome cocktail party. Mandrogi, on the Svir River, is a reconstructed traditional Russian village complete with charming wooden houses and cobblestone walkways. Perhaps buy some traditional handicrafts in the workshop or sample the country’s favourite beverage in the Vodka Museum. Enjoy a picnic lunch ashore to the accompaniment of traditional Russian folk music. Today's included excursion takes you to the open-air museum of wooden architecture on the island of Kizhi, a UNESCO World Heritage Site that includes an impressive collection of churches, chapels and houses. From the small settlement of Goritsy, an included excursion visits the 14th-century monastery of Kirillo-Belozersky where you will see ornate frescoes and ancient icons. Enjoy an included tour of Yaroslavl, Russia’s second largest city during the 17th century. The historic centre is now a World Heritage Site. See some of the city’s impressive churches, such as the Monastery of Our Saviour and the beautiful Church of Elijah the Prophet, and perhaps take a stroll along the banks of the Volga. An included walking tour reveals the highlights of Uglich and uncovers its chequered past, which is linked to infamous figures like Ivan the Terrible and Boris Godunov. You will also visit the former local Kremlin and to the Church of Tsarevich Dimitri-on-the-Blood, which stands near the spot where Prince Dimitri, son of Ivan the Terrible, was murdered. Join a farewell dinner this evening. An included sightseeing tour introduces you to the great landmarks of Russia's cultured capital city. Red Square is home to many of the key attractions here, such as the colourful St Basil's cathedral, Lenin's Mausoleum and the Kremlin. Your ship remains moored in Moscow for the next two nights. Today’s included excursion visits the vast Kremlin complex with its gold-domed churches and iconic bell tower. Inside the complex you will see a vast collection of impressive Russian art, including delicate tapestries. Disembark your ship after breakfast and travel to the airport for your return flight to the UK. Save up to £50 per person in selected cabin grades! Return flights and transfers. Return regional flights may be available & may carry a supplement. Terms and conditions apply. All offers are subject to availability and operators booking conditions. Prices are per person based on two passengers sharing the lead in grade stateroom unless otherwise stated. All discounts have been applied to fares displayed. Offers may be withdrawn or changed at any given time.^Itinerary operates in reverse, please call to confirm. †Optional travel insurance available to customers who book within 18 months of departure date. If you do not take the optional travel insurance, you may be entitled to a deduction from the holiday cost. Please call to confirm details. We charge a one-off small £20 booking fee. That’s it - nothing more and no add ons when you pay the balance. E&OE. ABTA P6710.